My race doesn't end at the finish line. In life, and in running, limits are something that we often use as excuses to keep ourselves in our own comfort zones or to stay lazy. With two kids, I have learned that what I thought my limits were, they were not, but also that if I (or my kids) push too hard, too fast, too long… something breaks (usually my patience). Running, for me, is similar. I have surprised myself every time I have “been a runner”. I have succeeded when I (and many others) would have put money on my failing. I have overcome. I have surprised myself. I have defined NEW LIMITS on what my body and my mind are capable of. (Even though I have several times, pushed that knowledge out of my mind as an excuse to not do something… the “I can’t” mentality is a much easier one that the “I can” — unless you want to. It’s a bit complicated). The point is, that, like in life, in running you can push your limits just hard enough to define new ones. But do it too hard, too fast, too long… and something is going to break. Take it from me – I am the poster child for overuse/overtraining injury in running. My Marine Corps Marathon training was riddled with overuse injuries. Injuries that could have been prevented or helped if only I would have RESPECTED MY LIMITS. I didn’t have to GIVE IN to them, I didn’t have to SETTLE FOR them, but I had to RESPECT them. I didn’t it and it cost me my medal. I don’t know ALL of my limits (do any of us? ), but I know now that I need to LISTEN harder and more carefully to my body. That I need to respect what it says and react responsibly. The main PHYSICAL LIMIT is that my body likes to go slow & steady. (Not slow like a 13 minute mile, but slow as in not too much, too fast). And so, my training right now is going to be just that: Slow & Steady, but still PUSHING me a little more beyond my current limits so that I can GROW. I am currently training for a 5K – It is NOT my favorite distance because it is too short. Just when I am starting to get into my groove… the finish line appears!? I REALLY like the 10k, but have never tried a half. I have trained up to 19 mile runs for a Full, but I am fairly certain that a Full will NEVER be my FAVORITE DISTANCE. So it will likely be between the 10k and Half… but I can’t jump that far ahead in my training just yet. After almost 5 years of hardly any working out and definitely no running, I need to take it one step at a time. Remember: RESPECT the limit, but don’t give in to it (I’ll get there eventually). I am also doing a Run/Walk Interval training that will eventually have me completely running the 5K, but as I progress I will do a little of both and slowly but steadily work my way up. I will complete the program in 14 weeks at which point it will be time for my first race which I already registered for, because again, LIMITS. There are physical limits and then there are mental limits. I am my own MENTAL LIMIT. I need something or someone else to hold me accountable. In this case, registering for the race in June and paying the fee means that I used valuable resources from our family budget to commit to training and completing this race. I need that kind of accountability. Add to that, two ladies who are running with me, and family & friends who I have told about my goal and race day, and that’s all I need to know that I HAVE to do this… on time. I PUSHED my limits, but I respected them too because I committed to something that is attainable and do-able… if I had committed to a Half Marathon in June, then I would have basically spit in the face of my limits and in no way is that respectful. Limits are funny little things because they LIVE AND DIE by the unknown. They are limits because we haven’t broken/pushed them, but we are limited because we haven’t tried. (See what I mean, tricky little things, even to explain). Yet, as hard as they are to explain or define, we know what they are. And that right there, GI Jane (or Joe if you’re one of my male readers), is half the battle! If you KNOW YOUR LIMITS, then you can (respectfully) push them out of your way. 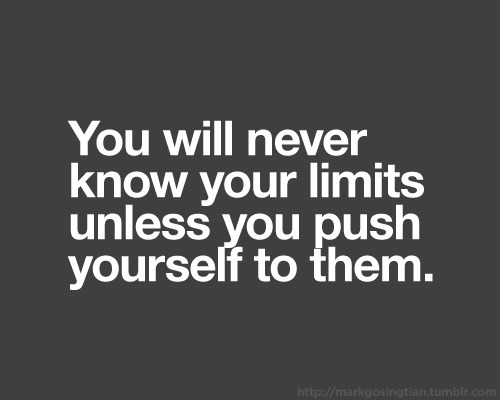 What are some limits that you need to push or have pushed? How do you RESPECT your limits while still pushing them?? I am first a Disciple of Jesus Christ, a wife and helper to my husband, Ronnie, and mommy to our three-year old daughter, Ali, 2 month old Landon and 4 month old Brayden! I try to live every aspect of my life in a way that will bring honor to God and bring others to know Him. Posted on April 18, 2013, in Uncategorized and tagged excuses, limitations, limits, mentality, motivation, run, runner, running. Bookmark the permalink. Leave a comment. Still Recovering… be back soon!